Cost of education: Tuition is based on whether the student is a domestic or international student, which faculty he/she is enrolled in, and the specific courses chosen (some have lab or practicum fees). In addition, students pay fees for various campus services and in support of their Students' Association. For details, please visit Costs. How, when, where to pay: We recommend payment through your banking institution (online banking, telephone banking or in-person at any branch) as the easiest way to pay. Credit card payment can be made only through the WebAdvisor online registration system; an additional fee will be charged. The deadline for payment is the first day of a Term. For more information, see Payment Information. 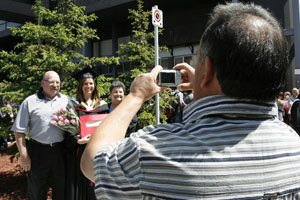 Financial Assistance: The University of Winnipeg is committed to assisting students with their direct education costs. The Awards and Financial Aid Office offers a wide variety of scholarships, awards, bursaries and campus employment. External funding sources can be accessed such as government student loans and financial assistance offered by private companies and organizations. Note: Students must register for courses before a confirmation of enrolment can be provided. Tax Time: At the end of February, the student's tax receipt for courses taken in the previous calendar year will be available to them through their WebAdvisor account. For instructions on accessing the form, visit Tax Receipts/T2202A form.